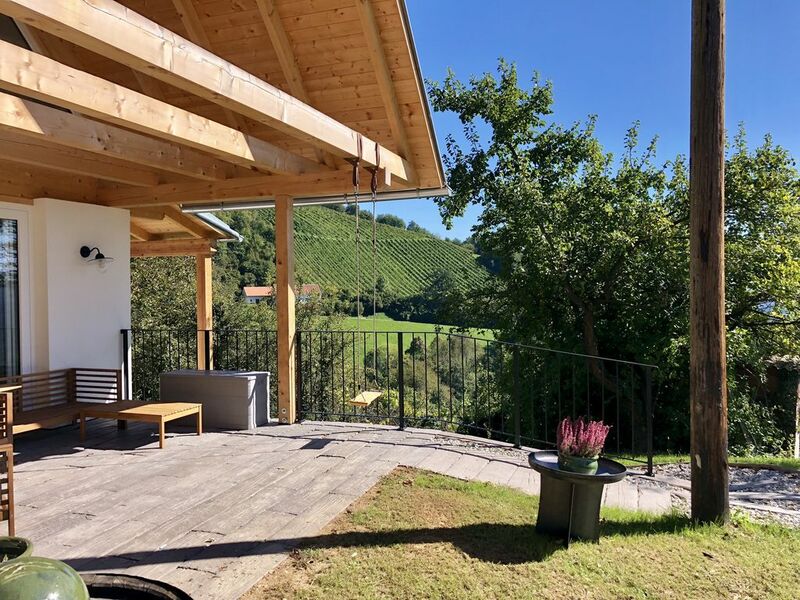 Nestled in the rolling hills of Southern Styria and located directly on the Sausal Wine Route in Kitzeck, our former Stadl radiates much warmth and well-being. 200-year-old wood and masonry adorn the walls and crossbars, the large glass fronts open the view of the surrounding vineyards and the Sulmtal. In this house tradition meets the conveniences of modernity and offers enough space for two people. An open fireplace, a panoramic sauna, a whirlpool bath and spacious terraces and gardens meet the highest standards and provide moments of relaxation and tranquility. The house is divided into a large, light-filled living-dining area with fully equipped kitchen and open fireplace and adjoining terrace. The cozy bedroom with a large double bed leads directly to the bathroom and another terrace. The panoramic sauna as well as the wine cellar await our guests in the basement of the house. With its own sauna and whirlpool tub in the middle of the rolling hills of the wine route. The area can easily explore with the associated electric scooter, numerous wine shops and taverns invite you to pause. Romantic retreat for couples to relax and explore the area. Leibnitz is just 10 minutes away and Marburg / Drau about 30 minutes for shopping and drinking coffee.